Meccanoid has 3 innovative ways to program and knows 3000+ pre-programmed phrases. Your new robot friend features voice recognition and smart device communication. 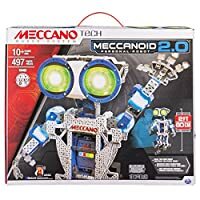 Meccanoid 2.0 is for ages 10+ and requires 4 D batteries (not included).